AEG Live has announced yet another addition to their lineup of festivals, the Revolution Rock Festival–fueled by Monster Energy–set for Saturday, September 17 outdoors at Foxwoods Resort Casino in Mashantucket, CT. 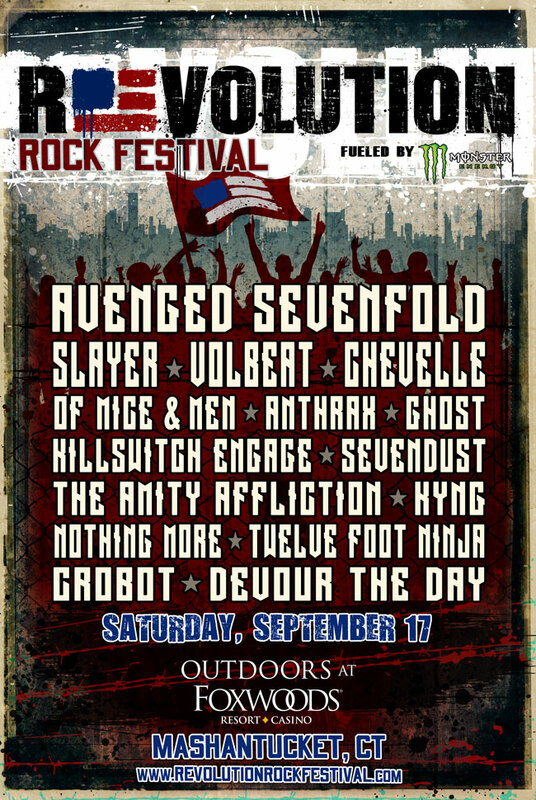 The powerful lineup for this new annual rock festival includes: Avenged Sevenfold, Slayer, Volbeat, Chevelle, Of Mice & Men, Anthrax, Ghost, Killswitch Engage, Sevendust, The Amity Affliction, KYNG, Nothing More, Twelve Foot Ninja, Crobot, and Devour The Day. Specially priced presale tickets for Revolution Rock Festival will be available from Wednesday, June 8 at 10:00 AM EDT through Friday, June 10 at 9:59 AM EDT at www.RevolutionRockFestival.com. Visit the Revolution Rock Festival social media pages for a password to purchase presale tickets. The public on-sale begins Friday, June 10 at 10:00 AM EDT. A limited number of Foxwoods Resort Casino VIP Hotel Packages for two or four people will also be available for purchase. Hotel packages will include VIP Lounge access, hotel for Friday and Saturday nights, and a $25 merchandise voucher per person. Visit www.RevolutionRockFestival.com for details. A limited number of discounted ticket 4-Packs will also be available for active military through Revolution Rock Festival partner GovX (www.govx.com). Revolution Rock Festival is produced by AEG Live, producers of many of the most compelling rock festivals in the U.S., including Rock On The Range, Monster Energy Carolina Rebellion, Rocklahoma and more.